My little plants survived the snow. But honestly, they haven’t been growing vigorously at all, before or after the snow. They moved outdoors on March 13th. At that time, the seedlings weren’t looking very healthy, and I thought the outdoor sun might be a better place for them. Transplanting didn’t go so well, and caused further stress. Soil fell away from their little roots while trying to get the plants out of their tiny plastic cells. New seedlings growing in my windowsills are suffering the same fate. 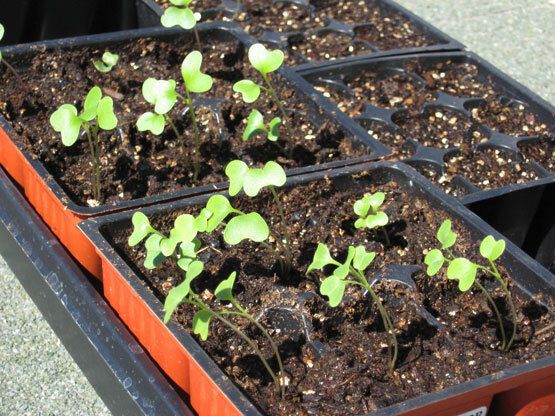 They germinate very well, but get too leggy, and don’t readily develop their first true leaves. I planted the trays in this photo on March 18th. While they look healthy, they are growing too tall again, and not developing true leaves. My research has led me to believe that the seedlings aren’t getting enough light, even in a bright windowsill with southern exposure. I also read that soilless mixtures are better for starting seeds, as the soil can contain bacteria and diseases that my baby plants can’t handle. I’d been using Mel’s Mix out of my garden boxes in these tiny plastic cells. 1. A grow light. It’s by “Jump Start” with a T5 full daylight spectrum flourescent bulb. Sounded like a fantastic bargain at $49. 2. Seed starters. I got some large peat moss pellets. 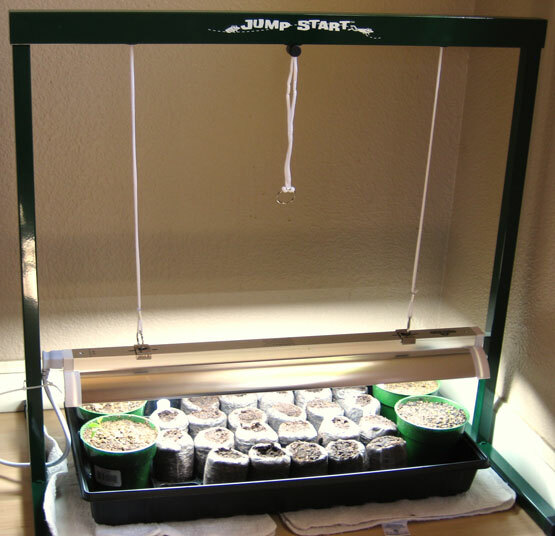 As another option, I picked out a sterile seed starting mix and peat pots. Both of these should eliminate any stress to the plant’s root system while later transplanting into the outdoor garden. Also, I purposely chose larger versions of these items. When my plants start to grow larger, I want them to have room to develop before going through the stress of transplanting. I only want to transplant them once, directly into the garden, without a transitional move into a bigger pot that many people choose. I also want to put my parsleys (2 Italian and 2 Curly, shown in the green pots) under the grow light, but I realized I need the plastic greenhouse cover for a few days, just until my new peat pots sprout. So, the parsley are sunning themselves outside for a few hours, and the plastic hood is now covering my newly planted seeds, under the grow light. Peas might be my favorite thing to enjoy directly out of the garden. They remind me of playing as a little girl in my Nana’s garden. I’d eat all the peas when no one was looking!